After a long, stressful day, sometimes there’s nothing more relaxing than a nice, hot bath. Essential oils are the perfect addition to help make any bath therapeutic and restorative. 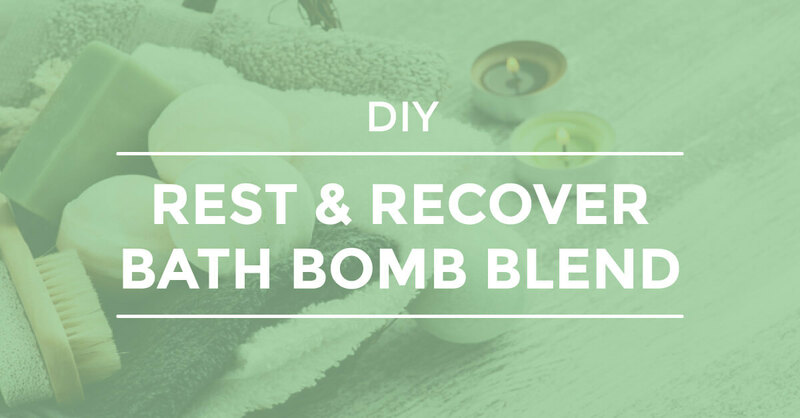 The Rest and Recover Bath Bomb Blend combines the incredible aromas of Mandarin, Ho Wood, Chamomile Roman, and Frankincense Serrata. In addition to having a sweet citrus scent, Mandarin can help soothe nervous tension and sadness when diffused. Plus Ho Wood and Chamomile Roman are both go-to choice for creating a calm, relaxing environment. So whip up these fun bath bombs and enjoy a fragrant and restorative bath! Whisk baking soda, Epsom salt, cornstarch, and citric acid thoroughly. 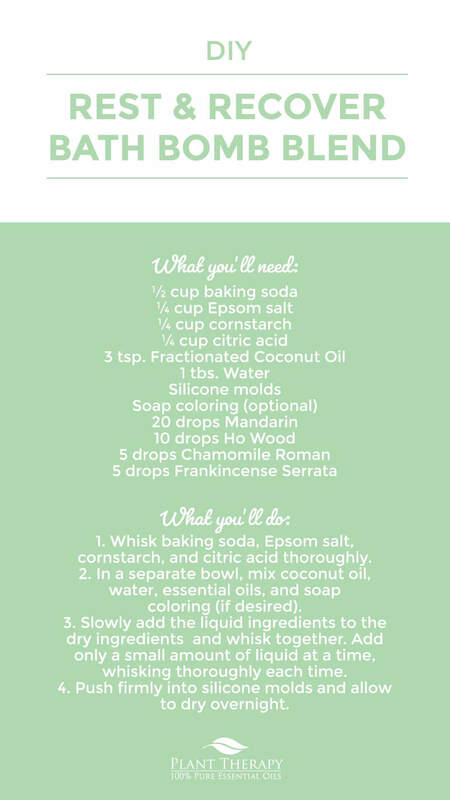 In a separate bowl, mix coconut oil, water, essential oils, and soap coloring (if desired). Slowly add the liquid ingredients to the dry ingredients and whisk together. Add only a small amount of liquid at a time, whisking thoroughly each time. Push firmly into silicone molds and allow to dry overnight. *Note: Please add a preservative if these bath bombs will not be used within a week. If I leave the water out of this recipe, can I leave it in a jar as foaming bath salts rather than molded into a bomb? What can one use as a substitute for cornstarch? Arrowroot powder? Same quantity? I will have to try these this weekend. Several of my favorite sleep ouls. Two of my favorite essential oils to make bath bombs out of are geranium rose and blood orange. Both of them are truly effective on me personally. They both make me incredibly relaxed and sleepy. Are a hot bath with either of those oils in them, crawling in bed for a good night’s sleep is the only option. I am literally out like a light after that. Does this require a preservative since there is water in the recipe? I’m going to have to try this one!! Thanks PT! I’ve been such all day and these sound heavenly. Thanks for the recipe! Just put in my first order of Plant Therapy Essential Oils… I can’t wait to get them. My son LOVES bath bomb baths, we will definitely be making some. I didn’t know you could make your own bath bombs, so I am excited to learn about this. I will be trying this out as soon as I can get all the supplies. Baths are relaxing! This sounds wonderful! Might have to try once I get more oils! Excited to try this DIY recipe! I’ve been purchasing essential oil bath bombs but it adds up quick! Excited to save some money AND create some bath bombs that are tailored to me! Can someone tell me how long these will keep? I want to make them to hand out at a meeting next month. Will they keep that long? THANK YOU for all of your DIY posts. VERY helpful and appreciated!!! Bath bombs are area of DIY bath products that I have not ventured into yet. I like the oils that are called for in this recipe so I may give it a try. Thanks for another great recipe! I actually have all these ingredients, yippee!!! Any idea how long these would stay good if I made a few or do they need to be used right away? I haven’t made my own bath bombs before, but now I just might! Thanks for such a simple recipe! who cant use this everyone needs a relax and recharge thanks for always being thoughtful enough to share wonderful recipes with us…. My daughter and I love making bath bombs! Can’t wait to try out this recipe! Thank you! Anything with ho wood is a win for me! I’m not the crafty/diy type of person at all but I might just have to try making these! My mom and I have been wanting to make some bath bombs, definitely going to try these! This is amazing, i can’t wait to try this! Is there a recipe for night time, or colds? Jessica, I’m going to link a couple of blogs that may help to answer these questions for you! 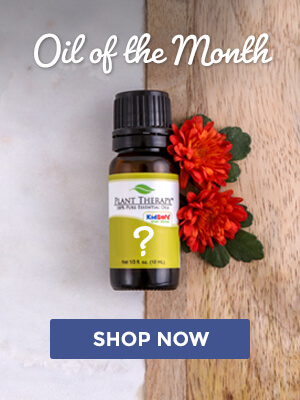 The first is on Essential Oils for Sleep (https://blog.planttherapy.com/blog/2019/01/03/essential-oils-for-sleep-2/) and the next is on Allergies, Essential Oils, and The Common Cold (https://blog.planttherapy.com/blog/2018/08/27/essential-oils-common-cold-allergies/). Hope this helps! Amazing DIY idea and gift idea! VDay is coming soon. Never made bath bombs. I don’t have all of the ingredients though, so need to do some shopping. I think I’ll have to make my first bath bomb recipe after seeing this! Sounds fun! Anyone know how many this recipe yields? I have not tried my hand at making bath bombs but this recipe sounds so easy! I can’t wait to try these once I get the stitches out of my back lol!!! They will be ready and waiting by the bathtub!!! Can’t wait to try this. My last DIY bath bombs were a fail. I am making these this weekend as I want them as gifts. They sound amazing!!! Would bath bombs and shower discs be the same? This sounds so amazing! 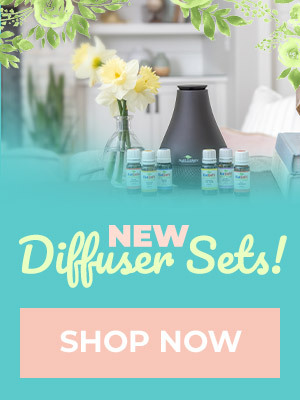 I’m so glad I have all these oils! Going to make soon! I love a good plant therapy diy!! Mandarin is the only ingredient I am lacking for this DIY! Time to get mandarin and give it a try! Can’t wait to try this one on my son. He plays sports and after a hard practice, I’m always looking for something to help him recover. so trying this tonight ! We just moved over the weekend and this recipe sound heavenly! I don’t have any Mandarin…what would be a good substitute for that one? These sound lovely and relaxing. I am adding Ho wood to my wish list! I know that using plastic containers isn’t safe. Are the Silicone molds okay to use to make these or are the stainless better? Just finished making this!! Can’t wait to try after work tomorrow! These sound absolutely Devine! I have all the ingredients too!!! This looks like a lot of fun to make. The possibilities are endless. Would make great gifts too!! Oh wow, how amazing! I love this and a nice simple recipe! Thanks! I love my baths and this sounds like a slice of heaven! Going to order me some Ho Wood which has been on my wish list for a while and give it a try! I can’t wait! This looks amazing!! I have made bath bombs before but have not tried this combination of oils!! 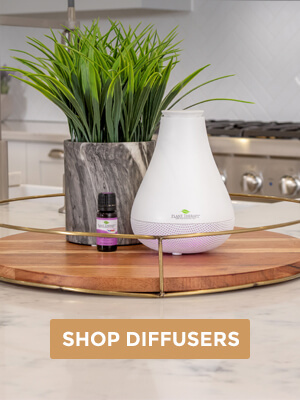 Can you switch out the frankincense with another to make it kidsafe? This sounds wonderful, I will have to look for other oils to use as I only have frank. This sounds very nice, can’t wait to try this one day. Too cold to go outside and Bath bombs is on my to-do list for today! Decided to check the blog before getting started. Thanks!